BARBADOS (AUS) (Grey 2008-Stud 2013). Winner at 1100m, ATC Styletread.com.au P., 2d ATC Rosebud 2YO Males Preview H. Out of SW Virage de Fortune (MVRC Australia S., Gr.1), a sister to SW Avenue (MRC Thoroughbred Club S., Gr.3), a three-quarter-sister to SW Slapstick. Related to SW Emancipation, SW Stratum Star, SW Railings, etc. Sire of 17 rnrs, 7 wnrs, inc. Atlantica, Bajan, Caribbean Pearl, Tropical Lightning, Bramfield, Caribbean Doll, Lady Conquistador and of the placegetters Martinique, Caribbean Wonder, John the Rodent, Lucky Master, My Blue Jeans, etc. His oldest progeny are 3YOs. ROSE OF LINCOLN, by Testa Rossa. 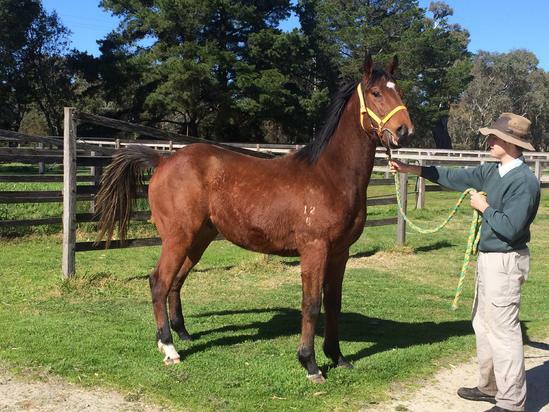 3 wins to 1100m, SAJC Sportingbet H., Melbourne Cup Live Racing P., 2d SAJC Capital Transport H., 3d SAJC Myer H. This is her second foal. Her first foal is a 2YO. Rose of Lincoln. 3 wins. See above. Northern Boss. 5 wins at 1100m, 1200m, S$217,529, Singapore TC Novice P., Class 4 H.-3 times, 2d Singapore TC Trigger Express S., 3d Singapore TC Benchmark 67 H.-twice. Wonder Alloy. 4 wins to 1500m in Macau. Greenbow. 3 wins to 1400m in Aust. Valour Under Fire. Winner at 1300m in Aust. Demagic. Placed in 2016-17 in NZ. SIMONSTAD (Kaapstad). 6 wins-1 at 2-to 1350m, A$350,110, VRC Rupert Steele S., Gr.3, BATC Sprint H., L, AJC Hall Mark S., L, STC Darby Munro S., L, VATC Biscay H., 2d SAJC Goodwood H., Gr.1, VATC Caulfield Sprint H., Gr.3, HDF McNeil S., L, QTC Blamey 2YO H., VRC Elms H., 3d QTC Stradbroke H., Gr.1, MVRC CS Hayes S., Gr.3, VRC Rupert Steele S., Gr.3, 4th VRC Gadsden S., Gr.1, MVRC AJ Moir S., Gr.2. Sire. Etre Accorde. 6 wins to 1200m, BTC Cleanevent H., QTC JM Gray-Buchanan H., 3d BTC Excimer Laser Vision Centre H.
Gold Cape. 3 wins to 1400m in Aust. DOTHRAKI (Mossman). 6 wins-1 at 2-to 1400m, A$1,210,085, Gold Coast Guineas, Gr.3, Qld Tatt's RC Tattersall's 150th Anniversary S., Gr.3, City Tatt's RC Lightning H., L, VRC Hilton Hotels & Resorts S., L, 2d BTC Cup, Gr.1, ATC Pago Pago S., Gr.2, BRC Moreton Cup, Gr.2, ATC Southern Cross S., Gr.3, Maurice McCarten H., Gr.3, Christmas Classic, L, Starlight S., L, Razor Sharp H., L, 3d ATC Galaxy H., Gr.1, VRC Tab.com.au S., Gr.2, ATC Skyline S., Gr.3, BRC BTC Classic, Gr.3, Gosford Guineas, L.
Procyon. 4 wins from 1400m to 1700m, A$82,340, ATC Daceyville H., 2d AJC Free Entry Today P., ATC Ascot Club P., 3d ATC Wiggins Travelmanagers H., STC Blackwoods for Alemlube H., TJ's Champagne Bar H.
Rababa. 5 wins from 1100m to 2200m, A$79,120, BTC Alcimedes H., MVRC Eight Carat H., QTC Lady Lustre H., 2d SAJC C&G Group H., Schweppes H., 3d SAJC Double Century H., VRC Saab H. Producer. Very Cherry (Anabaa). 2 wins at 1200m, 1500m, 2d MRC Le Pine Funerals H., Primavera H., MVRC Become a Member H., 3d VRC Gibson Carmichael S., L, MRC Zaidee's Golden Rainbow H. Producer. Superbo. 2 wins at 1000m, 1100m, SAJC Monfries & Burchell H., 2d SAJC Pilgrims Flask H., VRC Pago Pago H.
Sneeze in the City. 4 wins at 1200m, 1400m, 392,622Rgt. in Malaysia, Penang TC Malaysian Magic Millions Classic, 3d Perak TC Class 1 H.
Enthral (Three Legs). 2 wins-1 at 2-at 850m, 1200m, Avondale JC Improvers' H., 3d HBJC Gold Trail S., Gr.3. Producer. King Lilt (In the Purple). 5 wins from 1200m to 1600m, WATC George Moore Quality S., 3d STC Parramatta Cup, L, WATC Kaiser Stuhl S., L.
DOUBLE DARE (O'Reilly). 10 wins to 1500m, A$522,250, STC Maurice McCarten S., L, 3d QTC Stradbroke H., Gr.1. UNDISCLOSED (Pins). 7 wins from 1100m to 1600m, NZ$165,725, Counties Bowl, L, 3d ARC Eagle Technology S., Gr.3. PIN UP BOY (Pins). 6 wins-2 at 2-at 1000m, 1200m, NZ$147,125, A$22,500, Whangarei RC Northland Breeders' S., L, 3d ARC Railway H., Gr.1. SPECIAL MISSION (Towkay). 7 wins-2 at 2-from 1200m to 1600m, NZ$339,750, Te Aroha JC New Zealand Thoroughbred Breeders' S., Gr.1, Levin RC Ryder S., L, Wanganui JC Carters-Gib S., L, ARC Westbury Classic, Hawkes Bay Towkay H., Taranaki RC Istidaad H., 2d Hawkes Bay Highview S., Gr.3, 3d Waikato RC Foster Construction 3YO H. Producer.